The Nikon Coolpix S80 takes up where the S70 left off: bumping the megapixels up to 14.1 (from 12.1), upgrading the 3.5" touchscreen to OLED, and rounding some corners for a decidedly sleeker (like .7" thick sleek) look. The S80's touchscren will let you draw and stamp right on your pictures, just like recently announced S1100pj projector-cam, and it carries over the S70'S 5x optical zoom and 720p video capabilities. Like the S8100, it uses Nikon's EXPEED C2 processing engine. MELVILLE, NY (September 8, 2010) – Integrating stylish design with intuitive operation, Nikon Inc. introduces the new COOLPIX S80, equipped with a beautifully bright 3.5‐inch ultra high resolution organic LED (OLED) touch screen with an enhanced interface for a more enjoyable user experience. With a user‐friendly interface, the COOLPIX S80 gives the photographer easy touch control over the camera's key functions for smooth operation, including touch shutter shooting, zoom and playback. To help users better compose their photos, the S80 employs tab‐type graphics to maximize screen space without cluttering it with icons. When the camera is rotated for vertical shooting, display tabs and controls also automatically rotate for smoother shooting. The large 3.5‐inch ultra high resolution (819,000‐dot) OLED touch screen display delivers clear, rich image reproductions, bright vivid colors and excellent contrast. With a wide viewing angle (approximately 180 degrees), brightness control and an anti‐reflection coating, the S80's touch screen display makes it easy to compose, view and share photos and HD (720p) movies. "Our consumers not only rely on our compact digital cameras for beautiful photos and brilliant technology, but also as a reflection of their personal style," said Bo Kajiwara, director of marketing, Nikon Inc. "The COOLPIX S80's slim, sophisitcated design, touch screen technology and excellent features make it fun for consumers to capture high quality images and share their memorable moments." Measuring 0.7‐inches, the surprisingly thin COOLPIX S80 can be slipped in any pocket or bag for unbeatable portability. Sliding the lens cover turns the camera on and off, while creating a sleek, modern look. Available in six colors as bright as the OLED touch screen display, the S80 is not only a compact digital camera, but it's also a fashion statement. Cross Screen, Miniature Effect and Fish‐eye Effect. In playback mode, the user can even add moving stamps for an animated effect. In addition, the S80 features a new rating function that allows users to rate their photos with up to five stars and sort images according to their rating. The S80 is equipped with a built‐in slide show function, allowing the user to playback photos to pre‐set music for an enjoyable sharing experience. The COOLPIX S80 also features HD (720p) Movie with optical zoom and stereo sound available during recording. An HDMI output enables easy playback on an HDTV for big‐screen viewing of photos from a recent vacation or HD video from the latest family gathering. Packed into the super slim COOLPIX S80 are must‐have features like a 14.1‐megapixel CCD sensor and 5x Wide‐Angle Optical Zoom‐NIKKOR ED glass lens (35‐175mm, 35mm equivalent) to help the user capture beautiful landscapes and allow them to get close to the action. The S80 helps reduce camera shake with a 5‐Way vibration reduction (VR) Image Stabilization System that includes Optical and Hybrid VR, Motion Detection, ISO settings up to 6400 and Best Shot Selector, which automatically takes up to ten shots while the shutter‐release button is pressed, and then selects and saves the sharpest image. The S80 employs Nikon's EXPEED C2™ image processing engine to ensure outstanding image quality. To further help users take better photos, the COOLPIX S80 includes 17 scene modes and the Easy Auto Mode, which automatically recognizes the shooting situation and adjusts camera settings accordingly for great photos in any environment. For outstanding portraits, the S80 features Nikon's Smart Portrait System, which incorporates a series of automatic functions including In‐Camera Red‐Eye Fix™, improved Face‐Priority AF, Smile Timer, Blink Warning, Blink Proof and Skin Softening to flatter even the most camera‐shy subject. 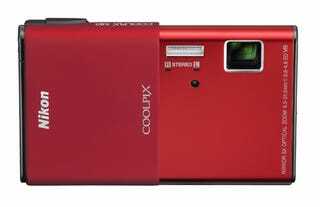 The COOLPIX S80 will be available in fall 2010 for $329.95* MSRP in a choice of stylish colors including red, black, blue, pink, gold and silver/brown.